Hinduism Mr. Narattam Pandey, representing the Hindu faith, gave a moving description of the beautiful ceremonies involved in a Hindu marriage and the deep commitment to each other that is instilled at every stage. “A proper ceremony which totally prepares the couple to dedicate to each other forever takes at least five hours but people want everything done super quick these days (and miss the point of what they are entering into).” Mr. Ujjwal Banga, who had just recently got married in a traditional ceremony to his wife Sudipta, posed the question of why there are so many problems in the UK. Marriage is all about sharing one’s life with another, and entering into this wonderful relationship which helps us go further in life and gives us what we can offer to the next generation. 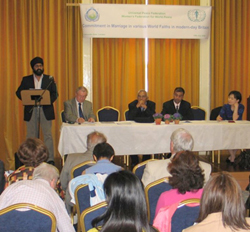 Sikhism “In Sikhism, marriage should create one soul in two bodies; the four vows are intended to seal the commitment between the couple," stated Mr. Jatinder Birdi of the Warwick Interfaith Forum. "Old traditions are becoming unfashionable but they should be revived. Also government, both national and local, needs to offer support.” Mr. Birdi was followed by his younger counterpart, Ms. Sarnjit Kaur, explaining how teenagers would appreciate guidance from trusted (experienced) persons but end up discussing with each other! People are scarred by the media, particularly TV. Women's Federation for World Peace Mrs. Taeko Duckworth, Vice President of Women's Federation for World Peace-UK commented that "A man and woman together represent the complete expression of God’s full image to this world, and they are not separable even in their origin. When a man and woman grow individually to maturity, they naturally come to seek the other half who will complete them. They want to become one in a harmonious way with love and respect, so that God can reveal Himself through their concord. Whatever school teachers, friends, and media talk about, the family is the school of love, source of wisdom, and origin of power for every one of us. The the parents are the key figures who run this particular school." Unificationist The Unificationist tradition was presented by Mr. Tim Miller, who talked about striving for individual maturity as a person of integrity, then marrying and building a family which embodies God’s love, life, and lineage, thus creating a foundation for peace on all levels from the family to world affairs. In our heart of hearts we all want stable committed loving relationships; we just need to make the investment required." A young representative of the Unificationist tradition, Jonathan Bateman, explained how he applied the teachings of his faith at university. He could see how his friends from families with good values, passed on to them by their parents, did well while those from more unstable families struggled.